Am I advocating revenge? Do I think the world is going to be changed by bullied kids uniting in retaliation against their tormenters? By no means! Rather, I take that old sports-ism to encourage parents to fortify their kids with specific skills that help young people stand-up for themselves and stop bullies in their tracks. In other words, I sadly don’t hold out hope that the world is going to change for our kids. I optimistically do believe, however, that our kids can change their own world by developing a set of skills that makes bullying unrewarding. Sometimes kids feel like adults never do anything–so why even bother to tell them about incidence of bullying? While there are cases when adults fail to acknowledge the seriousness of a situation, it is more often the case that grown-ups are not aware of what is going on. Bullies use relational aggression to inflict their violence in subtle, socially acceptable ways that tend not to register on an adult’s radar. Teach your child that it is her job to create awareness. Be clear in teaching kids that telling an adult about bullying is not a mark of cowardice, but rather a bold, powerful move. My daughter came to me yesterday, worried that if she told the bus driver about a boy who was spitting on her, then she would be labeled as a “tattletale.” I told her that this is exactly what the bully wanted her to think! Isolation is a bully’s method of intimidation. In fact, it is only by telling an adult that kids can begin to re-balance the power dynamic. When a bully realizes that he will not be able to keep a victim isolated, he immediately begins to lose power. The longer a bully has power over a victim, the stronger the hold becomes. 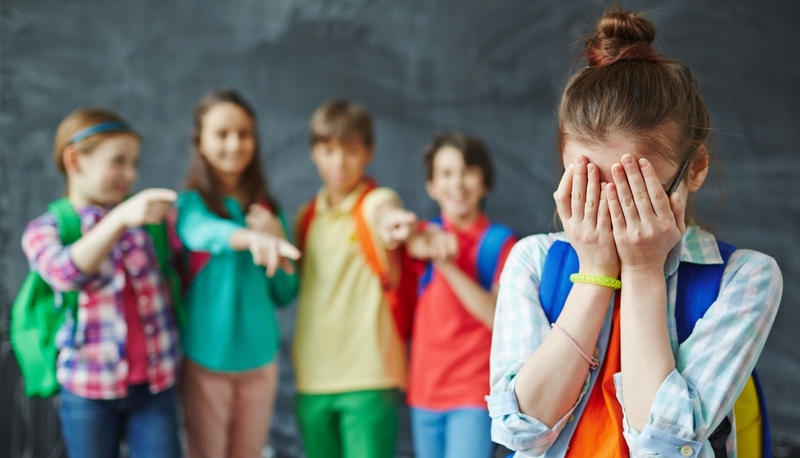 Oftentimes, bullying begins in a relatively mild form–name calling, teasing, or minor physical aggression. After the bully has tested the waters and confirmed that a victim is not going to tell and adult and stand up for his rights, the aggression worsens. Teach your child that taking action against the bully–and taking it sooner rather than later–is the best way to gain and retain power. The more a bully thinks he can pick on a victim without a response, the more he will do it. That’s why an assertive response is so effective in countering bullying. Kids who master the skills of assertiveness are comfortable in the middle ground between aggressive comebacks that up the ante for the next go-round, and passive responses that invite further abuse. Assertive kids use simple, unemotional, direct language to let bullies know that they do not intend to be victimized. Why should you teach your child to use responses that are “unemotional?” Indications that a person can be emotionally impacted signal a bully that he will be able to wield power easily. By encouraging your child to respond without angeror fear, you teach her how to portray confidence. The bully, in turn, detects less potential for wielding control. Want your child or a friends child to boost their anti-bullying skills and learn fun & exciting martial arts then click HERE to register for a free trial with Endeavour Martial Arts.